After reading through Drew Beechum and Denny Conn’s Experimental Homebrewing book, I thought through some of the questions that I see repeatedly asked. Drew and Denny touch on some of them. The spirit of their book resonates with me… find the answers on your own through experimentation. The reality is that for many of these questions – the answers are not black and white, and should be informed by experience and preference. Some issues are preventative in nature (if you don’t do this then it’s ruined), which makes seeing the real nature of an issue a bit fuzzy. The spirit of experimentation, and thankfully, a thoughtful approach to the question is also the core of Marshall’s work at Brulosophy.com. I have asked Chris Colby from the Beer and Wine Journal to add in his two cents, based on his years of experience and knowledge. He was kind enough to weigh in. Beer and Wine Journal features articles on Brewing and Food from Chris and James Spencer. Should I rehydrate dry yeast before pitching? I am a huge proponent of rehydrating dry yeast to the manufacturers specifications, which do vary slightly. I rehydrate to ensure that my yeast is proofed, healthy and ready to go. I also make sure to pitch the right amount of yeast and dry weight measurement is extremely convenient and simple. Plus there is no need to mess with a starter. Of course, there are kits and even some dry yeast manufacturers that do NOT recommend rehydration. FYI, The American Homebrewers Association recommends rehydration. Will your beer be ruined if you do not rehydrate? Of course not. Many people don’t want that extra step in their brewday. There is data that suggests that a portion of the dry yeast cells are lost when rehydrating in wort, largely due to osmotic pressures that destroy the cell walls. But there is also an argument that those dead yeast cells convert to nutrients for the remaining healthy cells. Brulosopher did a cool experiment on this topic. Why is this controversial? It shouldn’t be. The home brewer needs to determine what works well for their particular mindset and equipment! Chris Colby: Rehydration is a good thing — if it is done correctly (and the yeast tempered before it is pitched). If you’re not going to bother to slowly cool the yeast before pitching (stir in some wort to do this), it’s better to just pitch the dried yeast. Correctly rehydrating yields a high cell count of viable, active yeast. Skipping rehydration leaves a smaller — though almost always adequate — population of yeast to ferment the beer. Should I make a starter? Pitching rate recommendations vary, but generally the home brewer is encouraged to pitch at least 0.75 – 1.0 million cells /ml / degree Plato for an ale, double that for a lager. So gravity has a dramatic impact. Many professional brewers pitch 20-30% more yeast at 1 – 1.5 million cells / ml / degree Plato. Viability is important, especially with liquid yeast as cells begin to die quickly when not in an optimal environment. The starter proofs the yeast (waking up the viable cells and starts their growth) and allows the replication of cells to adequate levels. Check the dates on any yeast product you purchase, and make sure the LHBS stores it properly in a cooler. Finally, the reality here is that this is largely a horse shoes and hand grenades game. Adding a single vial of fresh yeast to 5 gallons of moderate gravity beer (under 1.070) will make beer, and often very good beer. However, when I am planning to brew, yeast viability and pitching rates are another control to ensure my batch has the best possible chance of successfully completing fermentation without any yeast derived off flavors. I have seen little difference in my fermentations when generally estimating the amount of yeast I am pitching, versus doing cell counts and carefully pitching the right rates. Yet I still believe this is the best practice to produce repeatable beer character and quality. Chris Colby: I’m a big fan of making an adequately-sized yeast starter. If you want to be sure you have a population of active, healthy yeast, sufficient to yield an ordered fermentation, making the effort to make a yeast starter will be worth it. You can skip making a starter for low-gravity beers if you are positive your yeast is healthy, but I like to see proof that the yeast is healthy when I brew. So, I always make a starter. I really do not want to spend a lot of time here. There are pros and cons to each, but we live in a time with an incredible universe of options in yeast selection, in liquid or dry form. Liquid Yeasts offer an amazing variety of strains, all healthy and ready to make wonderful beer. They bring classic characteristics to specific beer styles. However, handling requires them to be kept cool and shipping liquid yeast during summer months or warm spells can make that difficult. Liquid yeast can also be pricy. If you choose not to do a starter, and wish to pitch at rate into 5 gallons of a 1.070 beer, expect to buy at least 3 vials at about $7.00 each. That pushes the costs per batch up – and another great argument for making a starter and building up to the right pitching rate. Dry Yeasts are starting to expand in variety, but quite limited relative to liquid yeast choices. Many are ‘controversial’ based on their described characteristics and proposed usage. Here, you should research your yeast choices appropriately. I love dry yeast for convenience and price, especially in very clean ales with US-05. Experimentation is key. Brew a batch and split it with different yeasts to see the differences. Generally the vectors are in lag times, attenuation, flocculation and clarity, and perhaps more importantly in yeast derived phenolic and ester character. Many brewers like to pitch at the bottom of the recommended temperature range, and control the rise into their desired control point. Chris Colby: Dried yeast has come a long way since the early days of homebrewing. I brew with both liquid and dried yeast depending on the circumstance. And, I always keep a sachet of dried, neutral ale yeast (US-05) in my fridge as a backup. Should I secondary or just primary ferment my beer? There has been a long tradition of racking beer off the yeast as primary fermentation nears completion to avoid yeast autolysis. You will find that recommendation from most starter kits (which ship with a secondary carboy and racking equipment), older books on brewing and many ‘old school’ brewers. The second argument is about conditioning and clarifying the beer. Marshal at Brulosophy.com has done an EXBeeriment on this topic, along with a great photo of one of his brewing helpers! The term “Secondary” has lost its way a bit in the homebrewing world. In professional brewing, it traditionally referred to a secondary fermentation step that may have been necessary when malts were less modified and a high level of proteins remains in the wort or a product requires additional processing such as in high gravity brewing. Often, secondary fermentations are krausened with fresh yeast to ensure complete attenuation and additions of fruits or other spices added to ensure their character did not scrub out with the release of CO2 during primary. We should also recognize that autolysis is largely a bulk fermentation issue with tall conical fermenters at commercial breweries. There is a tremendous amount of pressure with the weight of many barrels of beer bearing down on the yeast at the bottom of the cone. This can cause a very rapid die off of cells that break down and can create off flavors. MOST homebrewers do NOT have this fermentation geometry or problem. I primary in ½ barrel conical fermenters and have left yeast in the cone for 6 weeks without autolysis. I have also left primary fermentations in buckets for as long as 4 months without racking with no off flavors. Autolysis is simply not a big issue if you are fermenting with healthy yeast and appropriate techniques. I do secondary when I am aging beer on wood or fruit. I seem to have better results when the beer is nearly fully attenuated and then add more sugars for fermentation (fruit). I also rack as gently and slowly as possible, often under the cover of CO2 to reduce chances of oxidation. Oxidized beer tastes pretty bad. Secondary may also be used for conditioning in bulk. Many homebrewers rush their beers through fermentation and into the bottle or keg, and this certainly is possible and viable. I find that a conditioning period, typically whatever is convenient in my primaries, results in a cleaner and clearer beer. I like to do this at lagering temperatures, but have also done long conditions at room temperature, and under pressure for many months. The premise of conditioning is that the residual yeast in suspension clean up by-products of fermentation that may result in off flavors. The other benefit is the clearing process where tannin and polyphenols slowly fall out of suspension (particularly in lagering where chill haze is cleared). I have worked out my pipeline such that virtually every beer gets an extended 3-4 week conditioning period. If I am doing a hoppy beer, part of that conditioning time will involve dry hopping for a few days or weeks towards the end of the period. If doing any extended conditioning, stay on top of your cleaning and sanitation regiment. So the real answer is that you should do what you are most comfortable with, fits your personality and schedule, equipment and produces good beer. The biggest benefit of a secondary for most homebrewers is to free up that limited primary fermentation space for the next brew! Chris Colby: With most reasonably flocculant yeast strains, racking to a secondary fermenter is not needed. For a few powdery yeast strains, racking can result in the beer dropping clear sooner. Given that racking will always introduce oxygen to your brew, I avoid racking to secondary unless it is necessary. Advances in quality of malts, availability of inexpensive gear and the seeming attraction of engineers to homebrewing have really moved homebrewing forward, resulting in the ability to produce exceptional beers at home. Lauter Tun design is no exception, and we really have Denny Conn to thank for developing and showing the benefits of batch sparging as well as his many other contributions. Still it seems that sparging technique is a polarizing issue with homebrewers. Lautering or Sparging is the process of removing the residual sugars from the mash after the mash process is complete. By measuring the gravity and volume of the first runnings, we can show that highly concentrated wort is produced in a short volume of wort. Additional water is added that rinses or extracts the residual sugars, and dilutes the first runnings to our target gravity, while providing enough liquid volume to achieve our batch size to boil. While extract efficiency is often used to measure the difference between traditional fly sparging and batch sparging, there is no definitive advantage to either other than necessary time to complete. Fly Sparging is the slow trickle of sweet wort run off while introducing a slow flow of sparge liquor to the top of the mash bed. Two things play here: the mash bed remains undisturbed while gravity and osmotic pressure allows the sugars to be extracted. Fly sparging is the traditional professional lautering technique and homebrew systems attempt to replicate this with fairly sophisticated pumps and delivery systems as well as mash tun designs. Lautering stops when the boil volume and gravity is achieved. This method takes patience, and is subject to slightly different mash chemistry as the buffering capacity of the mash is exhausted and the rise in mash pH can encourage tannin/polyphenol extraction towards the tail of the process. This is the method I prefer in my brewery because my system has the capability built in, and I usually see a few points of additional efficiency. It also slows me down a bit in the brewery, which can be hectic. No Sparge brewing is essentially mashing with the full boil volume of liquor factoring in the grain adsorption. This results in a thinner mash, and may require higher amounts of grain. Extract efficiency is often lower than in other techniques. No sparge may also require extended mash times as the thin mash MAY dilute enzymes relative to the starch concentrations. A single run off is then required to achieve your boil volume. I should point out that mash chemistry becomes more important when dealing with your water’s alkalinity and the diluted buffering capacity of the grains. So which technique is best? If it works for you, and meets your personal criteria, you are right. A good brewer will adjust his techniques to deal with any potential challenges. Who would have thought that three techniques (each with myriad hybrid variations) can achieve a great product? Chris Colby: I’m a big fan of fly sparging, although my (initially low) opinion of batch sparging has risen over the years for a variety of reasons. (I’m one of those crazy people who changes his mind in the face of convincing evidence.) I’d urge beginning all-grain brewers to try both methods a few times, then decide for themselves. I’d also urge beginners trying fly sparging to not worry about exactly matching the inflow rate of sparge water with the outflow rate of wort. Try “pulse sparging.” Add a volume of sparge water, then run some of it off (until the water is just above the grain bed), then add another volume, run it off, and keep repeating. This is hands-down my favorite polarizer. BIAB initially grew out of the Australian homebrewing community, and is a testament to efficient and innovative use of vessels. It is now very popular worldwide AND people get seriously obsessed and often defensive about this technique, not unlike their support of sports teams. Traditional method brewers seems to be offended that BIAB ignores some of the guidance for brewers over the past decades: very thin mashes, possible tannin extraction, using looking a little silly lifting a giant bag of hot dripping grains out of a pot. BIAB normally uses a single vessel, lined with a fine mesh bag, to mash the full volume of grain and liquor. You then lift the bag and let it drain into the boil kettle, and may or may not squeeze the bag (another controversy) or dunk sparge into some top up water. Everything else is the same – maintaining mash temperatures and mashing times (although perhaps slightly extended). This is probably the most convenient and simplest method of all grain brewing, particularly for small batches, but even a commercial microbrew system sports a modified version of BIAB using built-in hoists and stainless mesh baskets nested inside the big boil kettle. I use this method for many stovetop test batches to good effect. From a cost perspective, BIAB is an attractive alternative to complicated and expensive 3 tier or 2 tier systems, and what I recommend initially to folks that want to start all grain on a budget. A 5 gallon setup only requires a 8 gallon pot (for a full volume boil) or a cooler for a mash tun, a strong fine mesh bag to hold the grains (there are now commercially available bags for this! ), and a burner capable of boiling 6-7 gallons of wort. The only real downside is danger from handling the hot bag, which can also get prohibitively difficult to lift with 20-30 pounds of wet grains. Many folks rig some kind of hoist from their ceiling or a ladder to make this easier. Compared to an expensive RIMS system, BIAB is very attractive! Anyone who disparages BIAB brewers (or extract brewers for that matter) has not judged many flights in competition. Great beer really comes from good brewers with attention to detail. 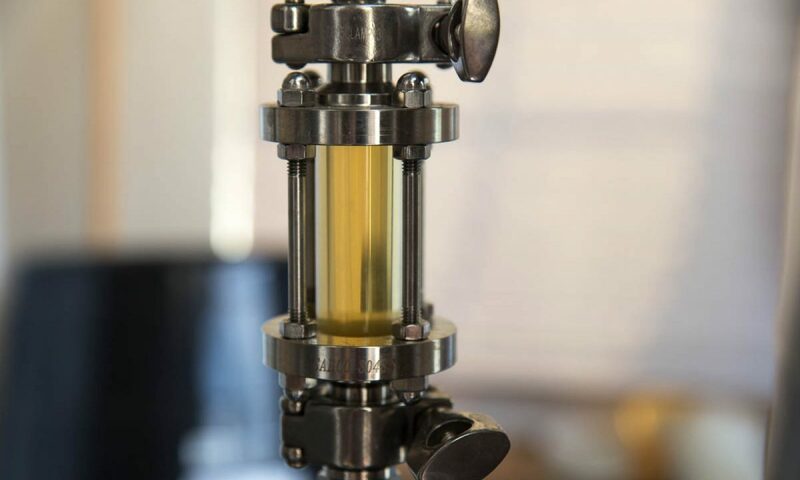 Each technique brings potential issues to the table, and good brewers recognize and respond to those issues to put great beer beer into the glass. Chris Colby: I’m a crotchety old man (in outlook, if not actual age). You BIABers get off my lawn! Controversies are generally created out of lack of empirical information and the stubbornness of humans unwilling to look at the other side of an argument. We naturally chase metrics that allegedly prove our skills are superior, such as extract efficiency. So much of brewing remains untested to the scientific method, particularly at the scale of the home brewer. Proof, in my mind, remains in the glass and on the palate. Finally, we must understand that the prevailing common knowledge of brewing changes. The world of brewing has moved forward. Malts are so modified today they have become nearly bulletproof in terms of yield. A global array of fresh yeast is at our fingertips and hop varieties have exploded. (un)Fortunately, a dizzy amount of information is available on the internet. As the old saying goes, “I read it on the internet so it must be true. NOT.” We ignore this skeptical frame of thought to our detriment. Often, we cannot find a definitive answer to our questions – so we MUST test and experiment. Not every homebrewing hero is right all of the time, so questioning the status quo and asking questions of experienced homebrewers can lead you to the right answer. Good stuff, right here! I’ve got exBEERiments planned for nearly everything you mentioned. What a difference a few years and a bit of experimentation has made on this hobby, eh? Cheers! Next PostNext Brewing Water Series: What is the Best Water?